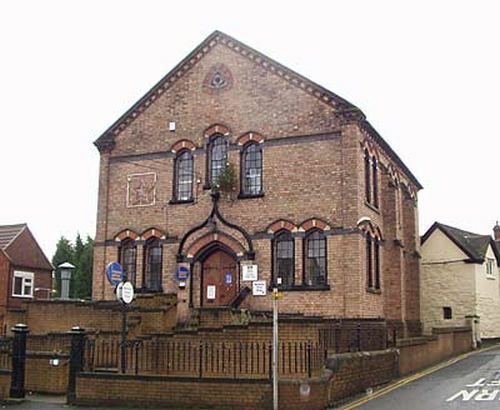 Primitive Methodists were meeting in the High Street in Madeley in the 1840s, and in 1851 they had 40 worshippers at their morning service and 65 at their evening one. After 1851 they built a small chapel in Prince Street. Then in 1865-6 they built the chapel in the photograph. Mount Zion chapel, built of polychrome brick, is situated at the corner of High Street and Station Road. The design is somewhat unusual in that it has grouped windows and an ogee-shaped hood-mould over the central entrance. It was described at the time as having "greater architectural pretentions than the previous one". It was designed by the architects Messrs Nevett, brothers. The foundation stone was laid on 14th August 1865 and the commemorative stone in the gable contains the date 1865. The chapel opened on the 10th of June 1866. It had seating for 250 worshippers. The chapel closed in 1977 and the building was converted to offices and workshops.